We have all put on an event for our student ministry that was a total flop. We have all put on an event in which was a total hit and students loved it. 1. Don’t just do it to do it – One of the biggest mistakes we can do it to put on an event just to put it on. We need have a destination for the event. What is the end goal for your students when the event was over? When we throw an event together it falls in the category of one of our church values of evangelism. We want to put on events in which the goal would be for our students to invite their friends who normally do not go to church and have them come, have fun, interact with us and come back. It’s a great first step. Have an end goal for the event. 2. 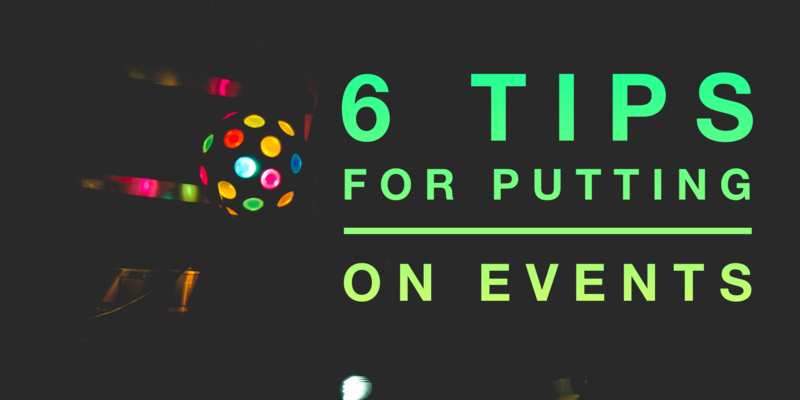 Make sure it’s not in vain – You might like the event, but your students might not. Sometimes we plan events because we like them not because our students like them. We don’t do it intentionally. I know I like to have some passion behind the things I plan but we defeat the purpose if our students are not all about it. I sat down with our student leadership team and we reviewed last year and they gave me the run down of the events that they loved and the ones I loved but they did not. You bet we won’t be doing some of them next year. 3. Get your leaders involved – Believe it or not, your leaders want to help. You might feel like you need to do everything because everything needs to be just right but when your leaders get involved they can take ownership and take it to the next level. One, you won’t have to do everything. Two, when you give away authority you create more buy-in from your leaders. Three, it gives your leaders opportunities to interact with students in different ways. 4. Promote, promote, promote – This might seem like a no brainer but even though you could talk blue in the face about an event, students don’t always see it, pay attention to it, or info does not get home to parents etc. For any event we do, we have a plan for a month out, the weeks leading up, the week of, the day of. 5. Keep it short – There is nothing worse than an event that should have ended 30 minutes ago. We all have been to an event or wedding or some thing that the momentum just died or ran out. I always love ended events on a high note and leave them wanting more. I think it’s okay to keep it short and have them think, “Man, that was so much fun, I didn’t want it to end” rather than thinking, “Okay that was great but when is it over?” You want to let them go home on the high note. Typically when we do an event after our service, we end service at 8:30-45 and the event will stop at 9:30 sharp. Seems like that is a sweet spot for us and always ends on that high note. 6. Capture it – If it is a reoccurring event, make sure you grab video or pictures. One of the best ways to promote events is show them what it was like last time so they can get excited. Plus, they love to see themselves on the screen. If you cold give them an idea of what they will experience in the video they will be able to share it with friends. What else would you add for successful events? Justin, what have been events you have done after service? Do you go off-site or keep them on site? Thanks for reading! I would say 95% of our events are on campus after service. I see that you had a “silent disco”. How did your ministry go about doing that? We used a company called Silent Storm. Easiest thing ever. Thanks Justin! Great refresher on this topic. Especially appreciated the detailed timeline for promoting! Blessings my friend.